Having a 4 year old in the house can be difficult when you are trying to catch some Olympic action but have to argue why watching the 20th re-run of a Dora the Explorer is less important when the dream team is playing. Luckily, my cable provider Foxtel has 8 live channels (yes, sorry about that NBC thing my US friends), and I have the US equivalent of TiVO called Foxtel IQ, which means I can catch the action post 4 year old bedtime. However, when learning about Foxtel’s Olympic iPad app, I was hit by that “WOW” factor of what the future of TV will hopefully be like. First to what the app does well (which is the main reason you want it anyway): Watch sports! The home screen is beautifully laid out with all the channels streaming (with lesser quality to accommodate all the streams, but good enough to see what’s on). The moment you choose a channel, it pops up with some more info and becomes crystal clear (I’d argue even better than on our 5 year old Plasma), and you can tap again for full screen. Suddenly I found myself walking around the house with the iPad, not missing a beat of the action. Truly awesome. 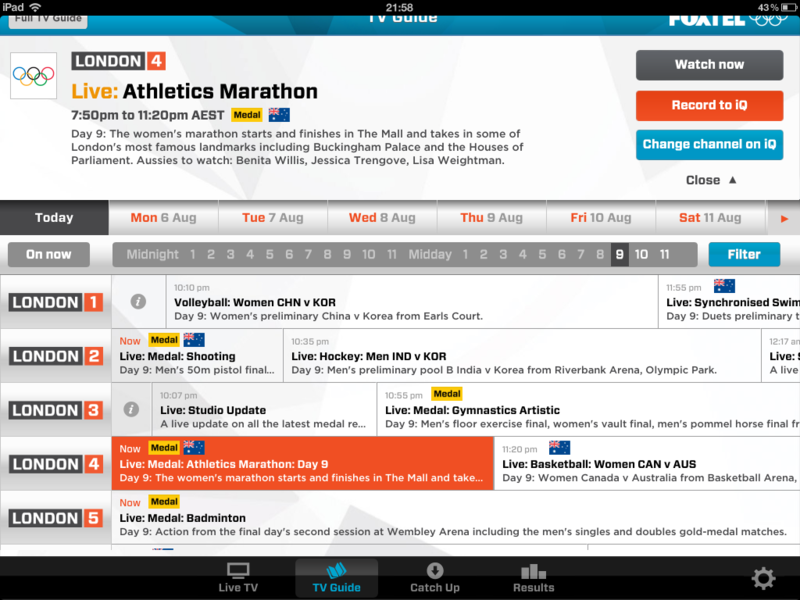 Another cool feature is the “catch-up” feature, which provides a direct link to recorded events you may want to see. Unfortunately, if you are not Aussie, this is less useful as only events with Australian athletes have been recorded. 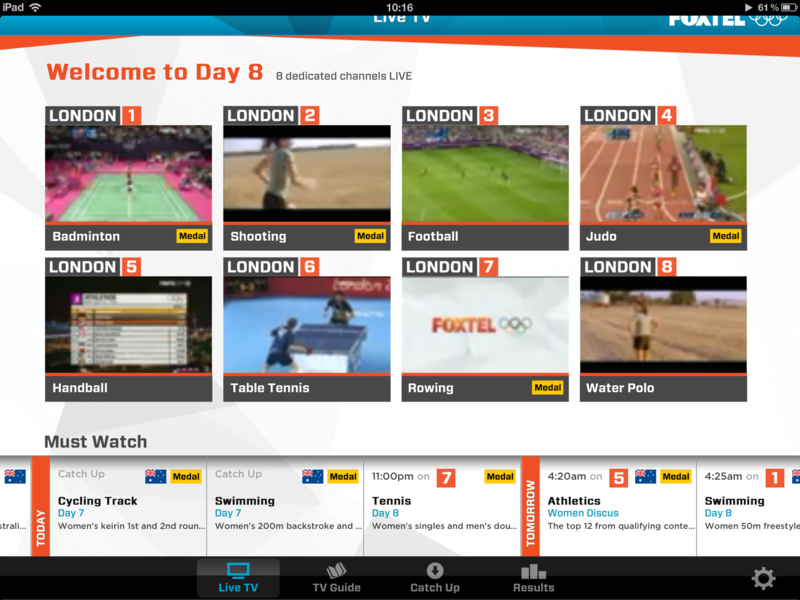 Tagged with companion app, Foxtel, iPad, London 2012, Olympics.